Michael Symmons Roberts tells afresh one of the founding stories of our culture and world history in this two-part dramatization based on The Gospel of Luke and The Book of Acts. In this two-part dramatization based on the Authorised King James version of the bible, poet Michael Symmons Roberts tells afresh one of the founding stories of our culture and of world history. The ancient writer known as 'Luke' is believed to be the author of the most dramatic of the four gospels - which bears his name - but also the New Testament book Acts of the Apostles, known as 'The Book of Acts'. Luke is believed to have been a Greek doctor, which explains the medical details he gives of the healing miracles! He worked in Syria but retired to his native Greece and died at the age of 84. 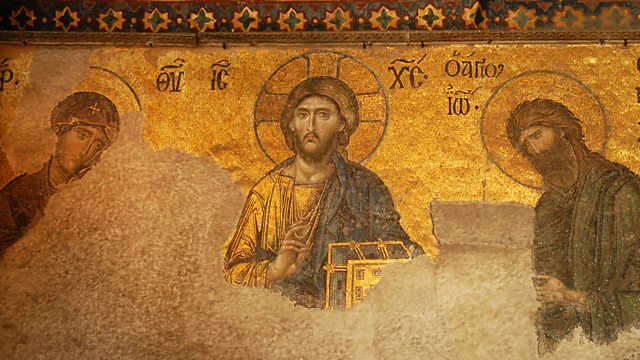 As a gentile, he encountered this new sect - Christianity - when he met Paul in Syria and converted to this new faith, accompanying him on his missionary travels. Luke and Acts have strong personal relationships at their heart and are written as detailed accounts of the rise of early Christianity. Luke’s Gospel is specifically addressed to a figure called 'Theophilus'. We know that Paul, who was converted on the road to Damascus, spent several years under arrest in Rome awaiting trial and Theophilus is supposed by some scholars to be part of the defence team at Paul's trial, although there is no definitive identification of him or her. In this drama, Theophilus is a young Roman woman who seeks out Luke in the AD60's, three decades after the death of Jesus. Luke has come to Rome with Paul to support him in his forthcoming trial. As part of this support Luke is writing down as accurate an account as he can of the events leading from the birth of Jesus to the spread of the early church. Together they hope carefully chosen extracts from his account will equip the legal team to exonerate Paul. The Gospel of Luke tells the astonishing story of the life and ministry of Jesus from his birth through healings, miracles, betrayals, trial, execution and resurrection. The Book of Acts picks up the story after the resurrection with Jesus' disciples in hiding and devastated at the violent death of their leader. Then he appears to them, resurrected, and the book then tells the extraordinary story of the birth and battles and growth of the early Christian church, including Paul's dramatic conversion on the road to Damascus from persecutor to apostle. The Authorised King James Version is the world's most widely known Bible translation, using early 17th-century English. Work began for the Church of England in 1604 and was completed in 1611. Its powerful, majestic style has made it a literary classic, with many of its phrases and expressions embedded in the English language. With multiple parts played by members of the cast.